Early morning view of Bar Harbor, Maine and the the surrounding mountains. Bar Harbor is one of the most popular tourist destinations in Maine. Its proximity to stunning Acadia National Park makes it a natural jumping-off point for visitors to the Downeast and Acadia region. Although Bar Harbor has just over 5,000 permanent residents, its population swells during the summer due to the robust tourism industry. Nearby Trenton is a small town just northwest of Bar Harbor. Trenton is close to the Hancock County-Bar Harbor Airport, making it an easy destination for those arriving by plane. 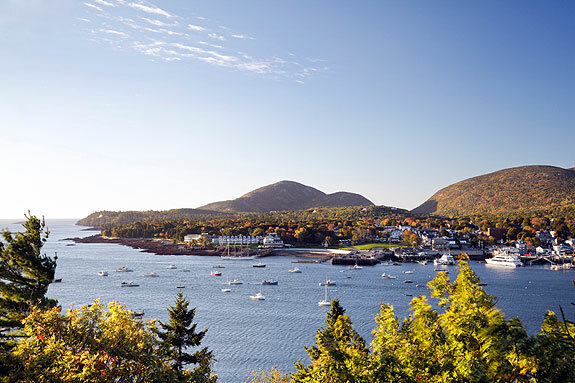 One of the most popular attractions in the Bar Harbor area is Acadia National Park. Acadia is the 10th most visited national park in the United States, with over 2 million visitors each year. The park offers over 100 miles of hiking trails, breathtaking ocean scenery, and carriage roads used by cross-country skiers, mountain bikers, and snowshoers. Thunderhole is an area of the park where you can watch the waves spout over 40 feet against rocky cliffs, making a thunderous roar. Several lighthouses in the Bar Harbor area are worth viewing. The Bass Harbor Head Light, located on the southwestern part of Acadia National Park, offers grounds tours although the lighthouse itself is off limits to visitors. Other nearby lighthouses include Mount Desert Rock Light, Great Duck Island Light, Bear Island Light, Egg Rock Light, and Isle au Haut Light. Bar Harbor is home to several high-quality museums. The George B. Dorr Museum of Natural History has exhibits highlighting the treasures of Maine’s natural world. All of the museum’s exhibits are designed and executed by students from the College of the Atlantic. The museum also offers family-friendly tours, nature walks, and scavenger hunts. The Abbe Museum in Bar Harbor focuses on the history and culture of Maine’s Native American people. Founded in 1927, the museum contains 50,000 archaeological artifacts from up to 10,000 years ago. One of the most prized artifacts is a 3,000-year-old flute carved from a swan bone. Other artifacts include copper tools, jewelry, arts and crafts, beads, pipes, axes, knives, combs, needles, and harpoons. The museum gives a fascinating peek into the everyday lives of Maine’s Native American tribes and preserves their cultural heritage. Call 207-288-3519 for more information about hours and accessibility. The Mount Desert Oceanarium is a hit with families and nature lovers. This facility highlights Maine’s unique ties to the ocean, with a Maine Lobster Fishing Program and Maine Lobster Hatchery that inform visitors about one of the state’s iconic industries. Kids love the Discovery Pool Touch Tank, where they are allowed to interact with a variety of ocean creatures. The oceanarium also runs the Thomas Bay Salt Marsh Tour, giving visitors an overview of this unique habitat. Downtown Bar Harbor features several small, independent art galleries. After a day of hiking or sightseeing, stroll through these galleries to find a beautiful piece of authentic Maine art. The shopping area also includes boutiques with clothing, crafts, antiques, jewelry, and local agricultural goods. The Taste of Bar Harbor is a fun-packed food festival taking place each May. The festival features a pub tour, special brunches at local restaurants, reduced price dining menus throughout the week, dessert night, and exclusive 7-course dinners with demonstrations by the chef. This festival is a great way to explore Bar Harbor’s dining scene for those on a budget. Bar Harbor also sponsors several art shows each year. Art in the Park is held twice per year on the Village Green, featuring local painting and photography. The Legacy of the Arts festival, held in June, celebrates local artists with special exhibits, demonstrations, and meet the artist sessions. Each year, the Bar Harbor Music Festival delights music lovers with its excellent performances. Concerts range from jazz to big band music to string orchestra performances. The festival includes several local venues and a variety of performing artists. Call 212-222-1026 for more information about this year’s festival. The Mount Desert Island Marathon, held the Sunday following Columbus Day, was dubbed “The Most Scenic Marathon in North America” by ESPN. The challenging course passes through Acadia National Park, along the shoreline, and through six towns and villages. The Bar Harbor area has dozens of recreational opportunities. To orient yourself to the area, consider taking a tour of Acadia National Park or a whale-watching tour in Frenchman Bay. Several tour operators plan guided hiking trips, trolley rides, and boat tours in the area surrounding Bar Harbor. The town also has several boat launches, allowing you to take a boat or sailboat to explore Frenchman Bay, Eastern Bay, and dozens of coves along the shoreline. Bar Harbor offers a variety of walking and hiking opportunities. The shore path from the town pier to Wayman Lane is a great way to experience Frenchman Bay. Walking to Bar Island during low tide is another popular route. For more serious hikers, Acadia National Park features over 120 miles of trails. Hiking to the peak of Gorham Mountain or Cadillac Mountain for spectacular vistas. Numerous Bar Harbor outfitters offer kayak rentals and guided kayaking tours. The area around Acadia National Park is considered one of the best sea kayaking destinations in the world. Kayakers frequently see porpoises, jellyfish, seals, and other ocean creatures. Spotting a whale is more rare but is an incredible experience from a kayak. For a fun kayaking adventure, paddle out to the Porcupine Islands, a group of small islands just off the coast of Bar Harbor. Acadia National Park’s steep cliffs and incredible views draw rock climbing enthusiasts from across the country. Otter Cliff and Great Head are popular sea cliff climbing routes that feature coarse-grained pink granite walls. Bird watchers enjoy coming to Bar Harbor for its dozens of unique species of migratory and nonmigratory birds. Look for osprey, bald eagles, ravens, black-capped chickadees, yellow-bellied sapsuckers, Atlantic puffins, peregrine falcons, Manx Shearwaters, and double-crested cormorants. Bar Harbor offers a variety of accommodations, from vacation rentals and private cabins to bed-and-breakfasts and historic inns. Options include budget-friendly motels as well as more exclusive resorts at which you’ll pay top dollar. Because the ocean plays such an integral role in Bar Harbor’s economy, there is never a shortage of restaurants serving lobster and other fresh seafood. The town offers excellent fine dining experiences as well as more affordable diners and cafes. Several microbreweries operate in Bar Harbor, providing a comfortable ambience to relax with a drink. Many visitors pass through Trenton on their way to other towns in the area, but it has several attractions to offer. Two small businesses — the Maine Coastal Flight Center and Acadia Air Tours — offer private flights through the Mount Desert Island area. Trenton also offers two golf courses with spectacular views of Acadia National Park and stunning ocean scenery. Children will enjoy Seacoast Waterslides and Fun Park, with mini-golf, water attractions, and other carnival rides. Trenton is a great place to stay when visiting the Acadia National Park region. Several local motels, cottages, inns, and vacation rentals provide accommodations at a range of prices. Most Trenton eateries are casual, including family-owned cafes, diners, restaurants serving Maine home cooking, and lobster shacks. Visit the following directories to find lodging, dining, attractions, shops, services and recreational activities in the Bar Harbor, Maine area.